Photos of 2016 foals must be submitted to Equine Legal Solutions in accordance with Contest Rules using our online Entry Form. ELS will post each qualified entry on the Foal Contest pages of its website. Entries will be posted in the order they are received. Missing or incomplete information may delay or prevent the posting of entries. Each Foal Contest post will include the foal’s name, foal’s breed, owner’s name, owner’s farm name (optional), and the owner’s city and state. If an entrant has indicated that their foal is for sale, this information, along with the entrant’s email address and/or telephone number, will be included with the photo on the Foal Contest pages. The deadline for submitting photos is midnight* on July 31st, 2016. Voting will begin August 1st and end at midnight* on August 15th, 2016. Winners will be announced after votes are counted and confirmed. Visitors to Equine Legal Solutions’ website can vote for their favorite in each category. Voting is limited to one vote per person, per category. NOTE: If multiple votes are received from a person in the same category, only the first vote in each category will be counted. Make sure you tell family and friends to go to www.equinelegalsolutions.com and click on the “VOTE” button to vote for your entries! Following the close of voting on August 15th, ELS staff will count all valid votes received via its website. In each category, the entries receiving the three highest numbers of valid votes will be awarded first, second, and third place, respectively. In case of a tie, Equine Legal Solutions staff will vote to break the tie. When all votes have been counted and winners determined, ELS will announce the contest winners on its website and notify individual winners by email. After the winners have been announced, their information will be verified and ELS will order personalized awards from its supplier. As soon as the prizes are received from the supplier, ELS will mail the prizes to the winners via U.S. Priority Mail. This contest is open to persons who are 18 years or older. Photos must be of 2016 equine foals – horses, ponies, mules, miniature horses, and donkeys are all eligible. Contest Rules - Please Read Carefully! Photos may be of 2016 foals ONLY. Each photo can only be entered in ONE category. You can enter DIFFERENT photos of the same foal in MULTIPLE categories. EXAMPLE: Tim Jones can enter a photo of Smokey in Best Personality, and a DIFFERENT photo of Smokey in Cutest Foal. You can enter photos of DIFFERENT foals in the SAME category. EXAMPLE: Tim Jones can enter a photo of Smokey and also a photo of Thunder in the Best Personality category. You CANNOT enter MORE THAN ONE photo of the SAME foal in the SAME category. EXAMPLE: Tim Jones will not be allowed to enter several different photos of Smokey in the Cutest Foal category. You CANNOT submit the same photo in MULTIPLE categories. EXAMPLE: Tim Jones will not be allowed to submit a photo of Smokey in the Cutest Foal category AND the SAME photo of Smokey in the Best Personality category. You may enter AS MANY qualified photos as you wish as long as you follow rules 1 through 6, above. No professional photos will be accepted unless submitted by the original photographer, UNLESS the photo is accompanied by written permission from the professional photographer. If you are not the owner of the foal, you can still submit the photo as long as the entry is made in the owner’s name. EXAMPLE: Susie Smith can enter John Jones’s foal in the contest as long as the entry is made under John Jones’ name. If you submit the photo in your OWN name (not the owner’s), the entry must be accompanied by written permission from the foal’s owner. EXAMPLE: Susie Smith cannot copy a photo of a foal from the Internet that does not belong to her and submit it in HER name UNLESS she provides written permission from the owner of the foal. Equine Legal Solutions reserves the right to reject any photo entry due to poor quality, unacceptable content, or noncompliance with contest rules. Photos must be digital in .JPG file format (no other file formats accepted). You must indicate which category you are entering the photo in (see #3). Each photo should be cropped close to the subject of the photo. Photos should be resized to 300 pixels high by 300 pixels wide. The file size is limited to 50K for each photo. Fill out the online Entry Form for EACH photo entered. You must submit a SEPARATE ENTRY FORM for each photo entered. The online Entry Form must be filled out completely - incomplete entries will not be accepted. All photos must be submitted by midnight* on July 31st. 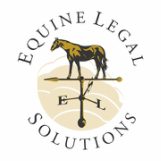 By submitting a photo to Equine Legal Solutions, entrants agree to grant Equine Legal Solutions permission to post the photo on Equine Legal Solutions’ website and otherwise use the photo in any manner that Equine Legal Solutions deems appropriate. By entering the contest, each entrant also grants Equine Legal Solutions permission to list the entrant’s foal’s name and breed as well as the entrant’s name, the entrant’s farm or ranch name (if any), and the entrant’s city and state. Equine Legal Solutions will not post mailing addresses. If an entrant has indicated that the foal pictured in the entry is for sale, the entrant grants Equine Legal Solutions permission to indicate on the contest pages of its website that the foal is for sale and provide the entrant’s telephone number and/or email address. Equine Legal Solutions will keep entrants’ information confidential except as specifically stated in these contest rules.